She proudly recalls times when her father was responsible for keeping an arsenal for the freedom fighters at their house in Nrnadzor, not far from Meghri, and she was able to play a small part in this defense movement. “They even gave me the nickname Sose because I was fearless,” she said, referring to the legendary Armenian woman who used to fight against Turkish soldiers in the late 19th-early 20th century. Now, Lusine does have some fears, however. She is worried about being unable to pay her next utility bill, her taxes, or the school fees for her eldest daughter, 19-year-old Arus, to continue to attend Armenian State Pedagogical University. It has been more than a year since Lusine has had to be a single-parent to her four children; Her husband, Sargis Balasanyan died in November 2014 at the age of 52. 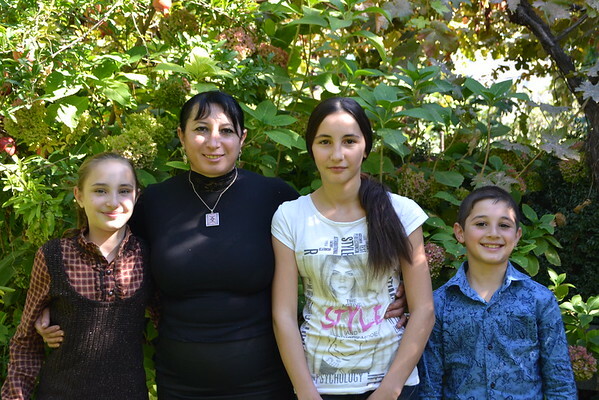 This year her three youngest became beneficiaries of FAR’s Children of Armenia Sponsorship Program (CASP) through which they receive financial stipends on an annual basis from supporters in the U.S. Her younger daughters, 13-year-old Sose and 10-year-old Ani, attend Meghri Saint Mariam Astvatsatsin Sunday hobby group where they learn bead work and practice drawing. This year FAR staff brought materials to support the group as part of CASP, which hosts more than 60 kids on a regular basis. Sose makes flags and flowers, while Ani is more into bracelets and necklaces, all of which they learned in the hobby group. And there’s still much more to do there, they said. Ani also attends needlework classes at Meghri Art Center and Sose takes free piano lessons. Their 9-year-old brother Gor doesn’t attend any hobby groups but he has dreams of becoming a boxer one day. “I receive a poverty allowance and the children now receive CASP support since my husband’s death. We also have several plots of land where we grow persimmon, pomegranates and figs. In a good year, we are able to pay back most of our debts,” she said, adding that her children really help her. “I would not be able to cope with everything alone. We do everything ourselves, which is a very hard and overwhelming job. We used to have cattle but I couldn’t manage to take care of them with kids so we sold them,” said Lusine. There is no additional family support as her in-laws died years ago. Still, she does her best to bravely accept the challenges and difficulties that life brings. Last year, she participated in an agricultural program where she learned how to prepare dried fruit and herbal teas that she tries to sell at agricultural expos and fairs when she has the chance.